Glow Lounge Technology's Media Center system is based on the black version of Zalman's stunning ZHD135B chassis. The specification is also very impressive: a 2.4GHz Intel Core 2 Duo E6600, complete with 2GB of DDR2 SDRAM and GeForce 8800GTS graphics card. The latter makes this system ideal for the gaming enthusiast - and HDCP. Watch premium HD download content, or install a Blu-ray or HD-DVD drive and enjoy hi-def movies on an HDCP-compatible monitor. Glow Lounge even supplies a DVI-to-HDMI cable in the box, so you can hook your system up to an HDTV. Interestingly, our review system came with Windows Vista MCE, although the Windows XP version would have worked just as well. 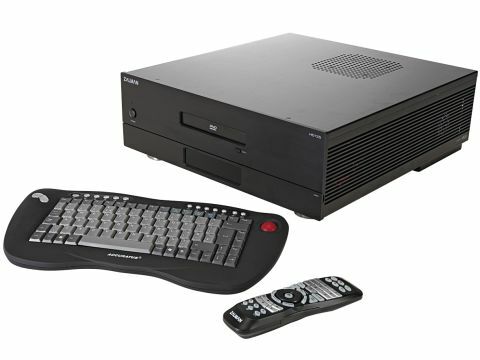 The Hauppauge NOVA-T 500 tuner means you can record two TV programmes at once and there's 750GB of storage. Yes, it's expensive, but this system is still very impressive indeed.